Law's Aglaia is a tree, up to 15 m tall. Bark is 3-4 mm thick, surface brownish-grey, mottled with green, smooth, exfoliations thin, semi fibrous. Blaze is creamy yellow, exudation white. Young parts, inflorescence, calyx and fruits are covered by yellowish-brown scales. Leaves are imparipinnate, alternate, rachis 3.2-20 cm long, slender or stout, swollen at base covered with yellowish-brown lepidote scales. Leaflets are 3-5, opposite or subopposite. Leaflet-stalks are 3-10 mm, leaflets 6-20 x 1.5-7 cm, asymmetrically broad ovate, elliptic-lanceolate or elliptic-obovate, base obliquely acute or obtuse, apex acuminate, obtuse or obtusely acuminate, margin entire, glabrous, densely scaly, leathery. Lateral nerves are 7-18 pairs, pinnate, prominent. Flowers are polygamo-dioecious, white; females and bisexuals in spikes; males in panicles or racemes, in leaf axils. Flower-stalks are tetragonous, short; calyx truncate, short, 4 lobed; lobes obscure; petals 4, circular, long, subentire at apex, glabrous. Fruit is a capsule, 1.5-2 cm long, obovoid, obtuse, yellow; seeds surrounded by a fleshy aril. 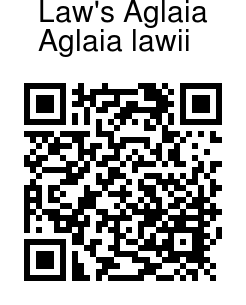 Law's Aglaia is found in Indomalaysia to Pacific Islands. 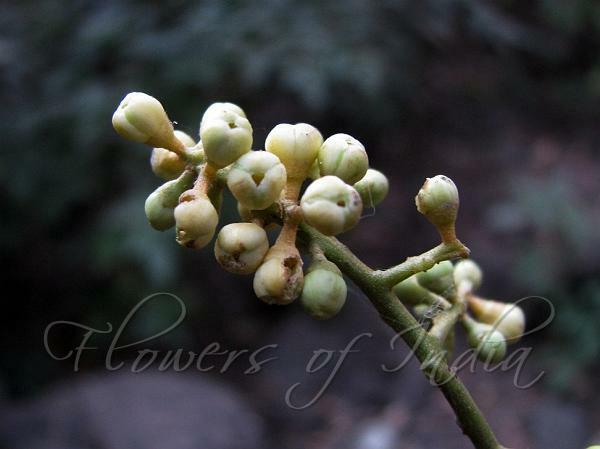 In the Western Ghats it is found in South, Central and south Maharashtra Sahyadris. Photographed enroute to Sidhagad Fort, Murbad, Bhimashankar Region, Maharashtra.